Description : If you like big explosions you want some dynamite. 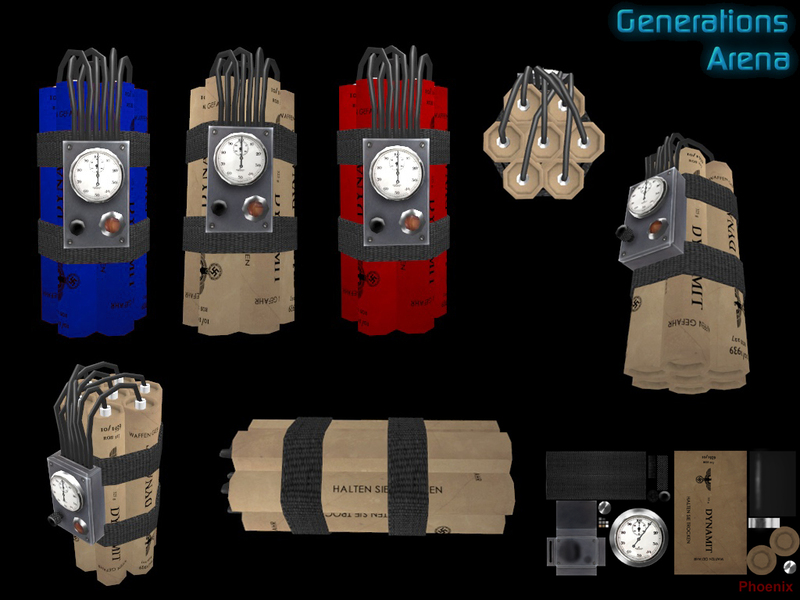 It's an old-fashioned bomb that has been equipped with a vibration sensor in addition to the standard mechanical timer. This blast from the past will reduce your foes to a pile of gibs within a cloud of smoke. It's certainly not subtle. If the large bundle of boomsticks doesn't visibly give it away the loud tick-tock of the mechanical timer will, so be sure to hide these where they won't be noticed until it's too late. Don't get too close to your own dynamite either as the vibration sensor doesn't care who it kills. In teamplay, the vibration sensor is augmented with a short-range tranceiver that can discriminate your team's Friend-or-Foe signals from those of the enemy. The explosion won't hurt your team mates either. As an added bonus, these fly right through an Invulnerability sphere, with very juicy results. Dynamite is pretty stable but it can be set off by explosions and gunfire. You can only carry 5 of these, and they're found as individual bundles.